Artist Ellen Wetmore has curated a group exhibition of work by the Boston Sculptors, an artists’ cooperative founded in 1992. The University Gallery at UMass Lowell exhibition highlights the work of 30 members. The show includes works both installed in the gallery as well as outside. 1. Explain the idea behind the Boston Sculptors’ show that you’ve curated. How to fit 20 years of sculpture and 30 sculptors into 700 square feet and make it an educational experience about material and form. 2. Being a curator is like a) channeling Simon Cowell, b) being an organic gardener or c) flying a jet. Who’s Simon Cowell? 4. The unauthorized biography of your life is titled: She’s Just Too Damn Big. 5. Share a surprise twist in the Ellen Wetmore story: I sometimes wish I was a surgeon. The money! The fame! The civic praise! 6. What is the most misunderstood aspect of being a curator? That it is a creative endeavor. 8. If Louise Bourgeois were to walk into the University Gallery at UMass Lowell, what would she say? Art is a guarantee of sanity. A Conversation with Nancy Selvage: April 23, 3-4:30 Gallery Hours: Mon – Thurs 10 a.m. – 7:30 p.m.; Fri 11 a.m. – 4 p.m.
Representative works from the Massachusetts Cultural Council’s Artists Fellowship program awardees Laura Baring-Gould, Rosalyn Driscoll, Beth Galston, Mags Harries, Sarah Hutt, and Julia Shepley as well as works by B. Amore, Caroline Bagenal, Kim Bernard, Benjamin Cariens, Gillian Christy, Murray Dewart, Donna Dodson, Laura Evans, Sally S. Fine, Peter DeCamp Haines, Ken Hruby, David Lang, Michelle Lougee, Joyce McDaniels, Nancy Selvage, Jessica Straus, Marilu Swett, Dan Wills and Andy Zimmermann will be on display. Outdoor works include Andy Moerlein, Margaret Swan, Hannah Verlin, Joseph Wheelwright and Leslie Wilcox. 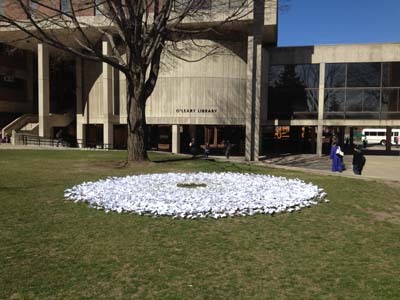 Image credit: Photographs of Flower of Lowell installation by Hannah Verlin. Each flower has the name and work site of each of 5700 women working at the Lowell mills in 1836. This exhibition is so strong, beautiful, and wonderful. I recommend that everyone get out and see this inventive collection curated by E.Wetmore. 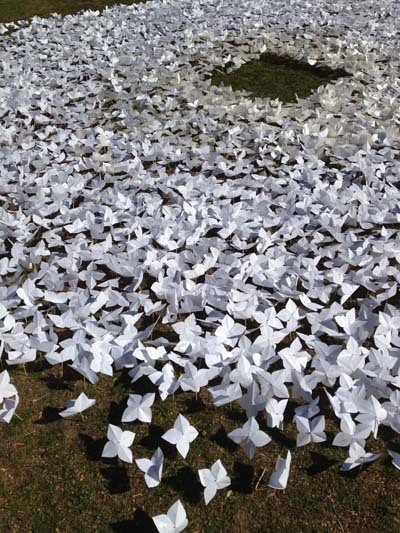 When I first saw the names of 5,000 women and girl millworkers scribed on the mandala field of 5,000 fair flowers, I started to cry ~ though the sun was so warm and bright that day. The piece haunted me with its innocence and sweetness. The show pulses with many kinds of life; and also visions of unstoppable death. Wetmore does, indeed, prove that the act of decisive curating *can be* a work of art in itself.